In the United States this is the time of year when people go back to school. As such, it is fitting to have a brief discussion about education. As most educated folks know, the United States used to be a world leader in K-12 education and higher education. While we still do very well in higher education, our K-12 system is something of a stricken ship. 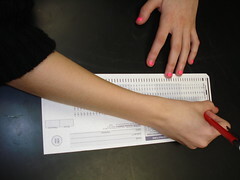 Test scores are low and drop out rates are high. These two factors cover a myriad of problems. However, one thing that rarely gets attention is the fact that a prime function of schools is that of being engines of conformity. The basic idea is that in addition to providing a basic (though often poor) education, schools also condition children to a certain way of life. Thinking back to my own education, it worked like this: when the kids arrive in the system they are taught to stand in line, to follow a time schedule marked by bells, to sit quietly in rows, to ask permission to even go to the bathroom, to conform to authority, and to do work at the behest of someone else even when they have no interest in it nor see value in it. The model is, as others have claimed, clearly based on getting children accustomed to working for a living. After all, that involves going some place unpleasant, living by a schedule set by someone else, and doing work one cares little for, often in an uncomfortable little chair. Of course, things have changed a bit since I was a kid. There are now metal detectors and police at many schools. There are zero tolerance policies that result in kids being expelled for having aspirin. There are security cameras, strip searches, vehicle searches, and more. In short, the factory model has been augmented with what can be regarded as the prison, security or police state model. Presumably this is intended to properly conform the children so that they will be ready to serve their corporate masters and be prepared to live in a world in which the threat level is never below Orange. Given these conditions, it is hardly shocking that the kids are not doing that well. Such conditions are hardly conducive to true learning. Of course, this is not the only problem-there are many, many more factors at work here, such as an obsession with standardized tests, budget problems, and a need for more good teachers.